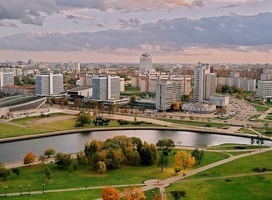 Belarus has recently emerged as one of Europe’s new travel destinations. Belarus tourism is on the rise because of relaxed visa requirements, excellent museums, an impressive Stalin-era architecture, Jewish heritage sites, and hospitable locals. We offer an excellent private Belarus travel package including not only Minsk but also visits to the historic places outside the capital escorted by your personal guide. For your Belarus holidays in 2019, we selected the most popular sites of the country based on previous years’ experiences of the most satisfied travelers. The best places to visit in Belarus are not only in Minsk. The capital has an excellent nightlife, exciting museums has also become known for some global summits and the 2019 European Games, but leaving Minsk, you will discover the western-style cities of Brest and Hrodna and be surprised by ancient castles and national parks with rare European bison (zubr). Chosen Belarus as your next Europe travel destination, Minsk is where you must arrive and depart to take advantage of a new 30-day visa free regime. The Belarusian capital will certainly surprise you. Contrary to its old dated reputation, it is a progressive, modern and clean city. You will like good standard hotels, impressive restaurants, and shining nightclubs. The tour to Belarus should be combined with trips to the castles of Nesvizh and Mir included in the UNESCO World Heritage List, an ancient city of Brest and Belovezhskaya Pushcha National Park – the most famous nature's reserve in Belarus.